Christmas Classics: The Holiday – Did You See That One? This one is the hidden gem on my list of Christmas films. The Holiday isn’t exactly a Christmas movie but it focuses on heartache and love during the holiday season. The film is directed by Nancy Meyers who also wrote the story. Meyers was previously nominated for an Oscar for Best Writing for Private Benjamin. She also directed It’s Complicated and Something’s Gotta Give. This movie stars a number of wonderful actors including Cameron Diaz, Jude Law, Kate Winslet, Jack Black, and Eli Wallach. When Amanda Woods (Diaz) and Iris Simpkins (Winslet) need to get away from their lives they find one another though a house swap program. Iris needs to get away from the man (Rufus Sewell) she loves who is engaged to someone else. Amanda just broke up with her boyfriend (Edward Burns) who found love with someone else. When Amanda arrives in England she finds herself being entertained by Graham, Iris’s brother. In Los Angeles, Iris meets a retired Hollywood writer (Wallach) who shows her the beauty of old films and new love. Iris also meets Miles (Black) a composer who is suffering through his own rocky love life. The two vacationers find themselves getting more than they bargained for over the holiday season. This is a wonderful romantic comedy. The acting works so well between the all-star cast. 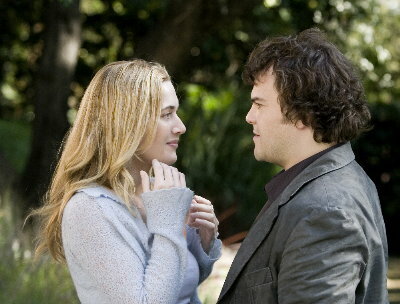 Jack Black made his serious film debut with this movie and proved himself to be more than a cheap laughs actor. He also succeed in playing a great opposite to Winslet. Cameron Diaz and Jude Law make the relationship between the two of them believable and fun. All the other actors come together to help make this film great. One of the highlights of the film is the score done by Hans Zimmer. The composer has worked on dozens of films and this is one of my favorites of his. I would highly recommend this film for anyone who enjoys romantic comedies. The film doesn’t focus on the Christmas season but it does touch on the spirit of the season. I give this film 3.7 out of 5 stars. This is a great movie! The music rocks in this movie!!! It’s one of the few times I rushed out to get the soundtrack to a film. Great all the way through. Pingback: Titanic | Did You See That One? Pingback: The Magnificent Seven | Did You See That One? Pingback: Backdraft | Did You See That One? Pingback: How to Steal a Million | Did You See That One? Pingback: The Intern | Did You See That One?